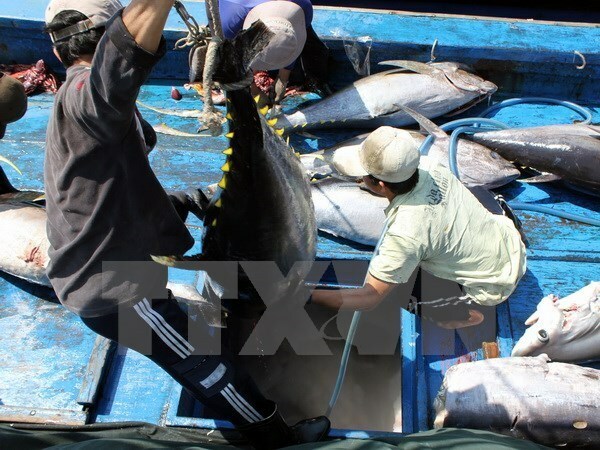 Hanoi (VNA) – Vietnam’s tuna export turnover rose 21 percent year-on-year to hit 271 million USD in the first half of the year, according to the Vietnam Association of Seafood Exporters and Producers (VASEP). Tuna fillet was the key earner, accounting for more than 48 percent of total tuna exports, followed by canned tuna (30 percent) and other processed tuna (15 percent). Vietnam exports tuna to 97 countries and territories across the globe, with the US, the EU, Israel, ASEAN, Japan, Canada, China and Mexico the major markets. Those countries accounted for 88 percent of total tuna export value in the first six months. Notably, tuna shipments to Mexico rose 125 percent, with the country surpassing Canada and China to become Vietnam’s sixth largest tuna importer. Despite the impressive growth, tuna exports are encountering difficulties in raw materials and import duties in some key markets. VASEP has proposed the Directorate of Fisheries under the Ministry of Agriculture and Rural Development develop purse seine fishing. It suggested the Directorate of Fisheries and the Ministry of Agriculture and Rural Development work with the Ministry of Industry and Trade (MoIT) to reach an agreement with the EU on a quota for tuna exports to the market.